The earliest machine gun cartridges were designed to use black powder (gunpowder) as a propellant. This is a simple mixture of saltpetre, sulphur and charcoal, and has been used for centuries. It is not ideal as a propellant, however, because of its inefficient burning characteristics and the large quantities of smoke and other residues generated. Improvements in chemical science in the late nineteenth century led to the development of smokeless powders, the first of these entering service in France in the late 1880s. Other nations soon followed suit, with the British version being known as 'cordite' because it was extruded in fine strings resembling cords, which were bundled together for insertion into the cartridge case. There are three different types of smokeless pro-pellant, known as single-base, double-base and triple-base. All are based on nitro-cellulose with nitro-glycerine (or equivalent) and nitro-guanidine as other major components in the more complex versions, triple-base including all three. Cordite is a double-base type. The increasing complexity of the propellants is due to the constant search for the ideal combination of characteristics. These include maximum power for a high muzzle velocity, moderate pressure and temperature to minimise the stresses and erosive effects on the gun, as little fouling and corrosion as possible, and a minimum of smoke and flash at the muzzle. Many of these desiderata are mutually exclusive so each propellant is a compromise. As with other chemical ammunition components, propellants must be insensitive to rough treatment, provide consistent performance over a wide range of climatic environments and be tolerant of storage for long periods in poor conditions. The performance of a given cartridge depends upon the maximum pressure which the gun is designed to accept. Pistols and shotguns, for exam- struck with a sharp blow by a hammer or firing pin pie, are usually only intended to work at relatively and thereby ignited the propellant charge. The firing pin of the gun indents the base of the primer cup (/) and the primer charge is ignited. The flame sets off the igniter charge (2), which in turn initiates burning of the propellant. the breech at the instant of firing, as will be dis- fire principle therefore soon fell from favour except cussed in the next chapter. Propellants today are generally prepared in the get shooting. istics suited to the gun. Primers are older than metallic cartridges. The first percussion primer was developed early in reloaded. In larger calibres, the primer ignites an the nineteenth century and this invention soon intermediate igniter charge. Little has changed in primer design since then. Primer DM 201 AI for 40 mm Bofors (Courtesy: Diehl) The firing pin of the gun hits the base of the primer body (1) and deforms it, thus a/so deforming the base of the primer cap (2). Due to the abrupt compression, the friction- and impact-sensitive priming charge is ignited. The flame penetrates the cover disc (3), presses the valve ball (4) forward and sets off the igniter charge (5) through the three firing holes. The resultant gas pressure presses the valve ball (4) through the blowback channel and back to the valve body (6), thereby sealing the primer against the base. The flame of the igniter charge (5) ignites the pro pel I ant in the cartridge case. it in place in larger calibres, and European cannon primers are often screwed into the case, apparently because this makes it easier to replace the propel-lant (the first element of ammunition to deteriorate after long storage). The only major departure has been the replacement in some cases of percussion ignition with electric. Electric ignition is achieved by passing an electric current from the gun through a special primer which is heated to ignition point virtually instantaneously. 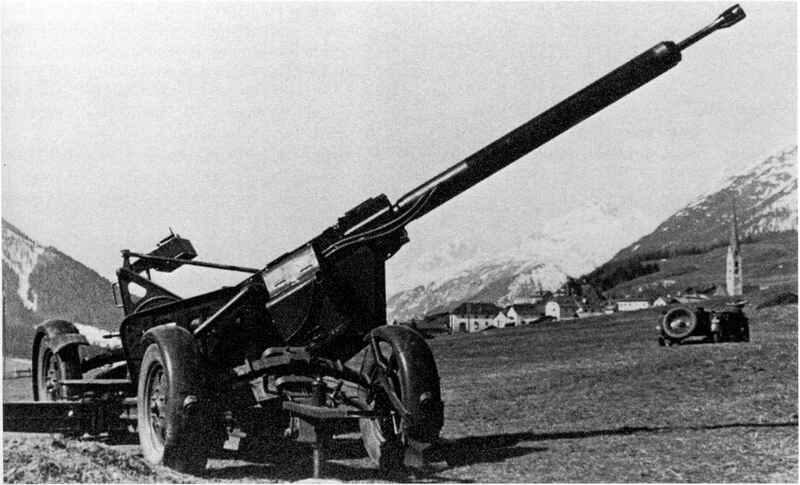 It was first used in automatic weapons in Germany to facilitate the synchronisation of aircraft guns designed to fire through the propeller disc of a single-engined fighter. Previously, this had involved a complex mechanical or electromechanical linkage between the propeller and the gun-firing mechanism to ensure that the gun fired only between the propeller blades. It was obviously simpler to design a direct electrical link between the propeller and the cartridge. Ironically, it came into service in the Second World War just before the need for it disappeared because of the advent of jet engines. Electric priming does have other advantages. It simplifies gun design because the firing pin and its associated spring and mechanism for releasing, withdrawing and recocking the pin are replaced by a simple electrical contact. However, it obviously requires a reliable supply of electricity and is therefore most suited to vehicle-mounted applications. isdiiTerent. However, in electric ignition the primer has to be insulated from the rest of the case and this insulation is sometimes visible. Needless to say, percussion and electric versions of the same cartridge have to be used in the appropriate gun as they are not interchangeable. The best known examples are the 15 X 96 and 20 X 82 rounds for the MG 151, the 20 X 128 Oerlikon and the 30 X 165 Russian (which uses electrical priming for naval and aircraft weapons, percussion for the AFV guns). There are others: the percussion-primed 20 X 110 widely used in the HS 404 and related guns was produced in an electrically primed version for the post-war American M24.